Eight persons A, B, C, D, E, F, G and H are born in two dates 8th and 27th of different months April, July, January and September of the same year. 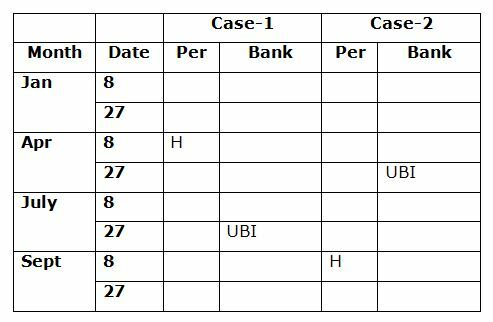 They are all working in eight different nationalised banks namely, BOI, BOB, Canara, CBI, IOB, SBI, Syndicate and UBI but not necessary in the same order. Two persons are born between the one who working in UBI and H, who was born in even numbered date of the month has even number of days. More than three persons are born between D and the one who working in Syndicate. 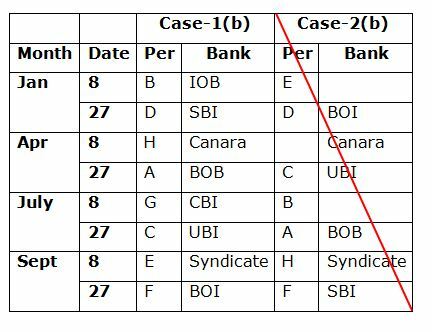 The one who working in Syndicate is younger than D. F was born immediately after the one who working in Syndicate.Three persons are born between C and the one who working in SBI. As many persons born before E is same as the number of persons born after the one who working in SBI. The one who is working in BOI born immediately after E. Three persons are born between A and the one who working in BOI. Only one person was born between B and the one who is working in Canara. As many persons born between C and the one who working in Canara is same as between B and the one who working in BOB. E does not working in Canara.More than one person is born between G and the one who is working in IOB. 1. G is working in which of the following banks? Two persons are born between the one who working in UBI and H, who was born in even numbered date of the month has even number of days. More than three persons are born between D and the one who working in Syndicate. The one who working in Syndicate is younger than D. F was born immediately after the one who working in Syndicate. Three persons are born between C and the one who working in SBI. As many persons born before E is same as the number of persons born after the one who working in SBI. The one who working in BOI born immediately after E. Three persons are born between A and the one who working in BOI. Only one person was born between B and the one who is working in Canara. As many persons born between C and the one who is working in Canara is same as between B and the one who working in BOB. E does not working in Canara. More than one person is born between G and the one who is working in IOB. G was born in the month which has 31 days. 3. How many persons are born between E and the one who working in BOB? 4. B was born in which of the following dates? 5. If H is related to SBI and C is related to CBI in a certain way. Then, A is related to which of the following? ‘Often university against’ is coded as ‘&L14 #F25 &Z20’. 6. What is the code for ‘Expressway’? 7. What is the code for ‘Road Traffic’? 8. What is the code for ‘Morning Walk’? 9. Which of the following will be coded as ‘#K5 &W9’? 10. What is the code for ‘Versatiled’? Two persons are born between the one who working in UBI and H, who was born in even numbered date of the month has even number of days. More than three persons are born between D and the one who working in Syndicate. The one who working in Syndicate is younger than D. F was born immediately after the one who working in Syndicate.Three persons are born between C and the one who working in SBI. As many persons born before E is same as the number of persons born after the one who working in SBI. The one who is working in BOI born immediately after E. Three persons are born between A and the one who working in BOI. Only one person was born between B and the one who is working in Canara. As many persons born between C and the one who working in Canara is same as between B and the one who working in BOB. E does not working in Canara.More than one person is born between G and the one who is working in IOB. G was born in the month which has 31 days. 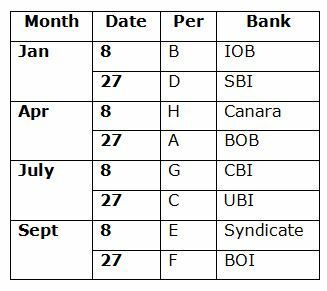 1) G is working in which of the following banks? 3) How many persons are born between E and the one who working in BOB? 4) B was born in which of the following dates? 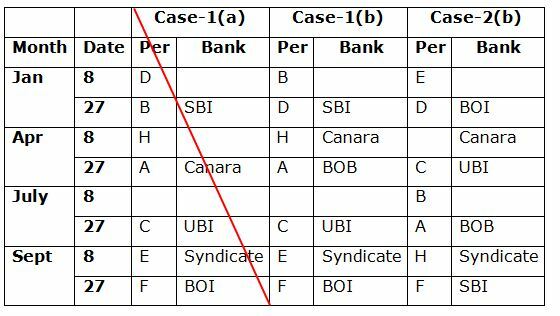 5) If H is related to SBI and C is related to CBI in a certain way. Then, A is related to which of the following? 6)What is the code for ‘Expressway’? 7) What is the code for ‘Road Traffic’? 8) What is the code for ‘Morning Walk’? 9) Which of the following will be coded as ‘#K5 &W9’? 10) What is the code for ‘Versatiled’?